Dagenaisite: Mineral information, data and localities. 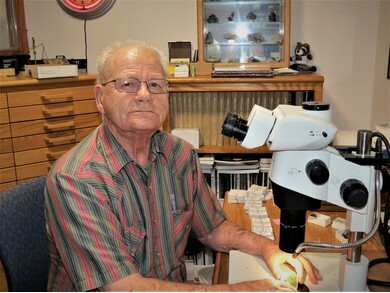 Named for John Dagenais (Sept 4, 1945 - ) a prominent collector and micromounter from Vancouver, British Columbia, Canada. Dagenaisite, Zn3Te6+O6, is a new mineral from the Gold Chain mine, Tintic district, Juab County, Utah, U.S.A. The mineral is the natural counterpart of synthetic Zn3Te6+O6, which has a structure based on an approximate close packing of O atoms in an hhchhc sequence along . Not analogous to mcalpineite, which is cubic. Compare the chemically related zincospiroffite. The five strongest lines in the X-ray powder diffraction patterns are [dobs Å(I)(hkl)]: 4.311(30)(310), 3.029(44)(222), 2.744(68) (-313, 421), 2.539(100) (-132, -422), and 1.6568(48) (-732, 350, -244). tiny light greenish-gray platelets, generally intermixed with amorphous material, forming porous masses that are apparently replacements of earlier phases. late-stage secondary phase formed by the oxidative alteration of earlier Te- and Zn-bearing minerals. Kampf, A.R., Housley, R.M., Marty, J. (2017) Dagenaisite, A New Zinc Tellurate From the Gold Chain Mine, Tintic, Utah, U.S.A. Canadian Mineralogist: 55: 867-873. At room temperature, the mineral is slowly soluble in dilute HCl and rapidly soluble in concentrated HCl. Kampf, A.R., Housley, R.M. and Marty, J. (2017) Dagenaisite, IMA 2017-017. CNMNC Newsletter No. 37, June 2017, page 742. Mineralogical Magazine: 81: 737–742. Kampf, A.R., Housley, R.M. and Marty, J. (2017) Dagenaisite, IMA 2017-017. CNMNC Newsletter No. 37, June 2017, page 742; Mineralogical Magazine, 81, 737–742; Kampf, A.R., Housley, R.M., Marty, J. (2017): Dagenaisite, A New Zinc Tellurate From the Gold Chain Mine, Tintic, Utah, U.S.A. Canadian Mineralogist, 55, 867-873.